The write stuff: Today and tomorrow, I'm in Brussels to chair the autumn leadership and communication conference of the European Speechwriters Network. 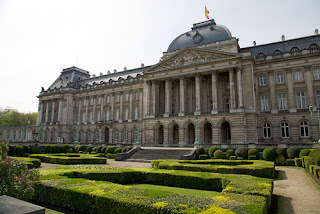 We're convening at the stunning Residence Palace, shown at right, in the International Press Centre, with attendees coming from Belgium, Canada, Denmark, the Netherlands, the United Kingdom, and the United States. I'm looking forward to seeing friends and collaborators, and expanding my network and thinking on speechwriting. We'll be talking about using social media to promote speeches, putting humor and quotations to work, the challenges of speaking in a second language (with perspectives from NATO, the European Union, and central banks), what Churchill's contemporary audiences thought of his most famous speeches, and more. Nonprofit communications: I'll be attending the annual conference of the Communications Network, a group of philanthropy communicators that's been a part of my professional life since my days at the Robert Wood Johnson Foundation.We have a varied and exciting agenda at this meeting in New Orleans, with speakers on everything from visual storytelling to communications strategy. Prior to the conference, I'll be in the city for my own annual company retreat, making sense of a fruitful and productive year. Workshops galore: I'm convening two workshops of my own in October, and you can still register for either Be an Expert on Working with Experts on October 8, or The Keys to Confident Public Speaking on October 17. Also in October, I'm facilitating workshops for two clients in North Carolina, including an unusual workshop on Telling Stories Three Ways: Using Visuals, Spoken Word and Social Media for nonprofit executives in the Guilford Nonprofit Consortium, sponsored by the Cone Health Foundation. And October also sees me conducting a workshop for researchers at Duke Medicine. On the page: You can catch my writing in Toastmaster, the official magazine of Toastmasters International, in the September and October issues. (Members get the magazine first, so I'll post links when the articles are more widely available.) I especially enjoyed researching an article on how technology has changed public speaking, from the days of Abraham Lincoln to TED talks, and what the ramifications are for speakers and audiences today. Look also for a piece on advice from top speechwriters, as well as ways you can use the same tools the pros do to enhance your speechwriting efforts. Of course, I'll have my eyes and ears wide open at the conferences I'm attending for other good ideas to publish here and elsewhere. Please do let me know if we can meet up at any of these events this fall. I love having the chance to meet in real life readers of the blog or folks with whom I'm connected on Twitter, Facebook and LinkedIn.